So the pastor of Most Sacred Heart of Jesus Parish in Jeffersonville embraced a plan from one of the parishioners to help individuals and families in the community when they don’t have enough food for their next meal. The parishioner’s idea involved making a “Blessing Box” — a small, stand-alone structure that would be filled with nonperishable food items and toiletries that anyone in need could access at any time of day. The plan also would include placing the “Blessing Box” in a discreet setting on the parish grounds so no one would feel uncomfortable taking items from it. “Everyone thought it was a great idea,” said Father Marcotte about the parish council’s approval of the plan. “It is an easy way to do one of the corporal works of mercy — to feed the hungry. 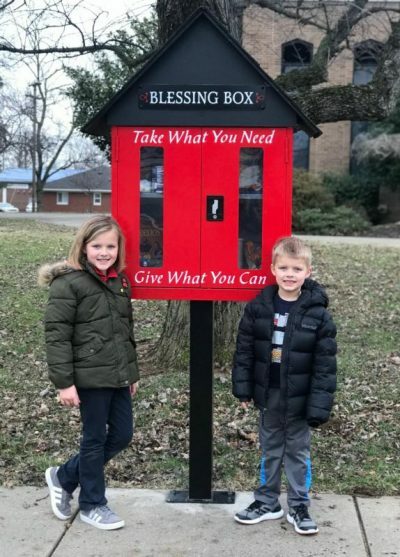 The “Blessing Box” is one more way to help people in the community in Clark County, a county where 12 percent of the population and nearly 16 percent of children younger than 18 worry about their next meal, the pastor told The Criterion, newspaper of the Archdiocese of Indianapolis. Set up Jan. 18, the “Blessing Box” was built by a parishioner and has been stocked by donations that include rice, pasta, canned goods, cereal and macaroni and cheese. Personal items such as socks, toothbrushes and deodorant have also been donated. Students in the parish school also are excited about contributing to the effort, said the priest, who also is pastor of another Jeffersonville parish, St. Augustine.